The Japanese Rock A Shacka label now has a european sister label: Rock A Shacka - Europe. 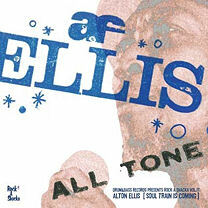 The European debut release is Alton Ellis - Soul Train Is Coming. This CD was planned to commemorate his 2009 tour of Japan and Europe, before his death on 11th October 2008. Now this release is a tribute to a singer who shaped the Jamaican music scene since the early 60's. With Coxone Dodd and Duke Reid who produced some very fine Ska, Rock Steady and early reggae. Some rare tracks and two by his sister Hortense Ellis. CD comes with a 16-page booklet (Japanese and English) containing in depth info by Mandingo and some rare photoes. Issued by Drum & Base records Rock A Shacka CD Vol. 17 German.